According to Jason Schreier during the latest Kotaku Splitscreen podcast (thanks, VG24/7), Bungie wanted to enable character transfers between platforms but Sony wouldn't allow it, citing that it "wants people to associate Destiny with PS4." 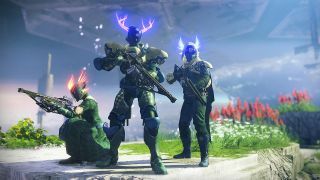 We're all aware of Destiny 2's timed PS4-exclusive content—though that didn't stop some folks playing on PC getting their hands on the Wavesplitter. Still, console players that would have otherwise been able to transfer a character to PC to join and play with friends, are unable to do so. Sony has really dug in its heels with publishers and developers that request cross-play; Fallout 76 and Wargroove are just two of the games that were denied. However, Sony recently caved in with Fortnite so maybe we'll see more PS4 games opening up cross-play in the future, though it seems unlikely there will be a rush.